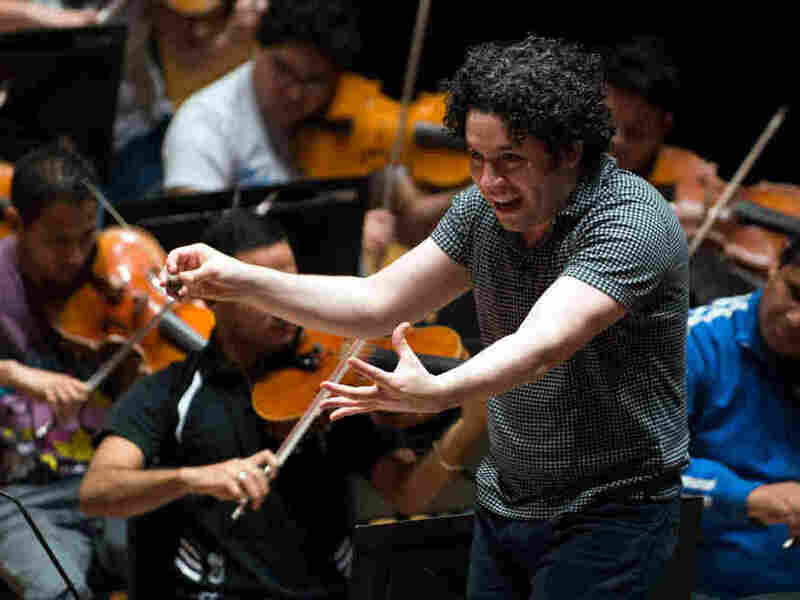 Venezuelan President Cancels Gustavo Dudamel's Youth Orchestra Tour To U.S. : Deceptive Cadence The crackdown on the star conductor's four-city American tour with the National Youth Orchestra of Venezuela is seen as payback for his recent criticisms of the Maduro government. The Venezuelan government has cancelled the upcoming U.S. tour by the National Youth Orchestra of Venezuela and its star conductor Gustavo Dudamel, who is also the music director of the Los Angeles Philharmonic and the Simón Bolívar Symphony Orchestra of Venezuela. El Nacional, a major Venezuelan paper, reported yesterday that the cancellation was ordered by the presidency. The decision is seen by many as payback for Dudamel's recent criticism about the political and social upheaval in his country. After a considerable period of silence, Dudamel finally spoke out in May, writing to Venezuelan officials in an open letter, "Enough is enough." That address to the government was published after the death of Armando Cañizales, an 18-year-old musician who had been trained in El Sistema, the same government-funded music program that Dudamel participated in as a child and now champions. The National Youth Orchestra of Venezuela is an offshoot of El Sistema. In July, in an opinion piece written for The New York Times, Dudamel wrote: "I have an obligation, as a Venezuelan citizen, to speak out against the unconstitutional decision by the government to convene a national constituent assembly, which will have the power not only to rewrite the Constitution but also to dissolve state institutions." According to El Nacional, President Nicolás Maduro accused Dudamel of not understanding the Venezuelan government and added, "May God forgive you." The planned four-city tour in September included stops at Wolf Trap in Virginia, Chicago's Ravinia Festival, and the Hollywood Bowl. Dudamel took to Twitter today to respond, saying his dream to perform with the "wonderful young musicians" cannot come true "this time." He added, "We will continue to play and to fight for a better Venezuela and a better world."